As I look at things now, Brandon Crawford has been as good a hitter this year as Matt Holliday and Kris Bryant. But, I understand it’s just May. Small samples can turn opposites into comparisons. So, turning to the past calendar year, I see beside Crawford’s name those of Torii Hunter and Aramis Ramirez. By now, it seems evident that Crawford is at least an average hitter or so. He’s showing signs, this year, of being something greater than that. There are people in the Giants’ organization who think you’re crazy. You don’t think Brandon Crawford can hit major-league pitching, but they believe you’re wrong. As the exhibition season opened Saturday, under a cloudless sky at Scottsdale Stadium, Crawford took the first steps toward resurrection. There was a time, really, when Crawford reminded people a little of Brian Bocock. And it’s not like Crawford debuted at an especially young age — when he came up, he was a firm 24. Ordinarily, glove-first middle infielders remain glove-first middle infielders. The Giants believed Crawford could be more than that. The Giants, at least, believed Crawford could hit enough to play. His defense hasn’t slipped. His hitting has taken off. It’s a simple graph, but an eye-opening one. There’s year-to-year progression, and this is for a guy who plays half the time in San Francisco, which keeps his offense down. As a rookie, Crawford had ten extra-base hits. This year, he’s up to 15, in two-thirds the plate appearances. There’s also this: Crawford has topped out at 10 home runs. He’s already up to six. It is definitely possible to fluke some power, but then, that’s what the next plot is for. For Crawford, hitting fastballs was long a project. Below, observe his productivity against fastballs, shown as runs above average per 100. And on the same plot, you can see Crawford’s rate of fastballs seen. We can learn a lot from how different hitters get pitched. Crawford, it’s no surprise, is getting pitched differently. 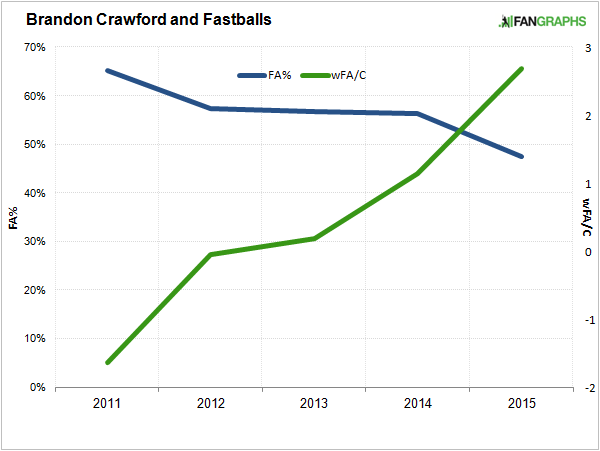 Every year, Crawford’s gotten more productive against fastballs. And he’s now seeing fewer fastballs than ever. As a rookie, Crawford saw two heaters for every three pitches. This year he’s dropped a few points below 50%, a rather sudden drop a few years after his first sudden drop. 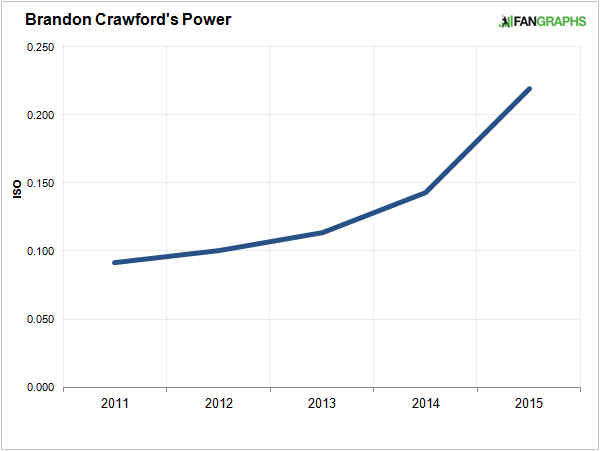 What pitchers recognized between 2011 – 2012 was that Crawford became a little more competent. And now, it’s almost like Crawford is being pitched around. He’s seeing a lot more secondary stuff, and he’s seeing fewer pitches in the strike zone. It’s not because Crawford is an over-aggressive hacker, either; he isn’t pitched this way because he’s Juan Francisco. Pitchers increasingly see Crawford as a threat. They’re more willing to take their chances with the next guy. Between the last two seasons, Brett Lawrie has seen the biggest drop in fastball rate, at about 11 percentage points. Crawford’s right behind him, in second. It’s a change that indicates pitchers are seeing something. This year, Crawford is starting with his hands a little lower. He has what seems to be a shorter path to the ball. But he also just seems to have a more forceful swing, deriving more power from his lower body. His back leg gets closer to a 90-degree angle. It appears there’s more force being transferred to his front leg. Crawford is getting more of himself into his swing, and while swing analysis like this can’t be conclusive, you can consider the signs. It looks like Crawford is swinging more powerfully. His statistics have gotten more powerful. And pitchers are treating Crawford like more of a power hitter. It all fits. Maybe we’d learn more if Crawford moved up in the Giants’ order, further from the pitcher’s spot, but here we are and everything’s promising. Crawford had already done enough. He’d already worked to turn himself into something like an average hitter, which is valuable when you’re a plus defensive shortstop. There are people who never thought such a day would arrive. But now it looks like Crawford is raising his game to even another level still. He’s trying to move beyond being a decent hitter, toward being a good one, an intimidating one. In the early going, it’s working. By average batted-ball velocity, Crawford’s right there with Jose Abreu and Josh Donaldson. If this is all noise, it’s doing a hell of a job of being convincing. I can’t imagine we’ll ever think of Brandon Crawford as a power hitter. But he’s developing into a pretty good hitter, with power. Who knew? I guess you could say the Giants knew, but I’m not sure they expected this much. We hoped you liked reading Brandon Crawford’s Development in Just a Few Pictures by Jeff Sullivan! You had me at ‘pictures’.